"There are many versions of the life of Pocahontas, the United States’ most famous Native American. However many of them are likely not true." "This lesson involves the students in learning about Pilgrim life and comparing it to their life. They will be learning about the Mayflower adventure and creating a vehicle for their own life adventure. They will also work with a group and create a play about their life adventure." Saints and Sinners - Surviving Plymouth - Players role-play being a Pilgrim. "Powhatan was the paramount chief of some 30 Powhatan Indian tribes when English settlers arrived at Jamestown in 1607. 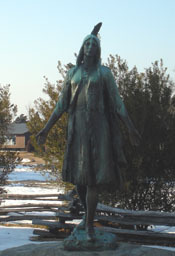 His daughter Pocahontas befriended the English and at times served as intermediary between the two cultural groups."